Isn't it well for some! 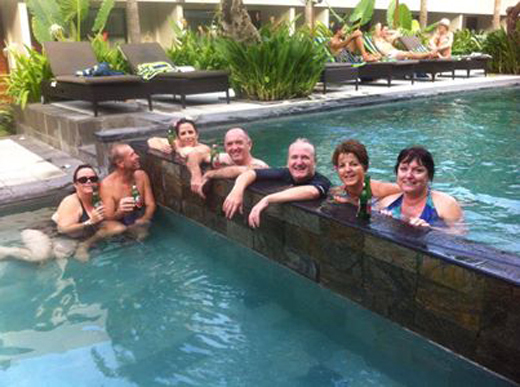 I have just heard that one of my nephews who now lives with his wife and family in Perth, WA., has started a well-deserved holiday in Seminyak, on the Island of Bali, Indonesia. I wish them well and hope they enjoy every minute of their stay there. The island has a population of about 4 million, is mainly Hindu in religion, and is well-known for its dances, sculpture, painting and music. It has everything a tourist would want. I wonder will I ever have the opportunity to spend some time there? I doubt it now. I I I I wish them well. I'm sure he would, but old age is a terrible drawback when faced by a challenge like that.
. my aunt toni, a lifelong traveller, went on her last long trip (to china) when she was ninety-seven. (she had been touring quite a lot widowed forty years previously.) she wrote that travelling as a little old lady alone was the absolute best, since people went out of their way to be extremely helpful and accommodating. i am sure she faced challenges as well, but being herself, what she noticed was the help she had in meeting them, as well as the architecture and natural beauty and food that also filled her postcards.
. my mother, in her seventies, was forced to put off a two-week vacation in europe with my father because she had to appear in court. she was suing the company that had bought out the hospitals she worked at and fired her and two colleagues (also in their seventies) in favor of younger workers, claiming that as contractors they did not have protection against age discrimination in the workplace. she won and collected two years' lost wages, and then she and my father took a three-MONTH tour of europe, spending the most time (iirc) in prague and vienna (where my father was born). every time she spoke to me she encouraged me to travel, saying that there were no challenges that couldn't be met, or that wouldn't make me a better person for having experienced. and this is my mom, who hates even flying on an airplane, hates having her routine upset -- she found the travel that rewarding. i am merely middle-aged, but i have chronic pain, and do have to drag that along in my baggage (though of course it requires care even at home!) last year i travelled to costa rica for several weeks, and quebec for a month, and i'm very happy to have done both. yes, the chronic pain made some of the adventures more stressful and difficult; on the other hand, there was so much else to think about that in a way it got to me less than it usually does. i took my meds, i made accommodations as best i could, and i had a really good time.
. there are always obstacles to travel (age, illness, other responsibilities). all of these are surmountable, if one is willing to make the attempt while keeping them in mind.
. there are always rewards to be gained in traveling -- it is a joy and a privilege to encounter the unfamiliar.
. the world is a huge and wildly varied place, and there is wonder and beauty to be found everywhere. if we travel, we open ourselves up to loving and appreciating this world better for encountering it face-to-face. and a greater love for the world and its glories is a sacred expansion of the heart. i wish i could sit with you over a cup of tea (if you indulge; i certainly do :) and tell you about my time in costa rica. it's a long strange story and ... let's just say i had a lot to overcome! but it was fabulous anyway. That makes me feel like rushing out and booking a long trip to somewhere exotic instead of the short break in Connemara I hadintended(although I do love Connemara)!